Steel City Skeptics | For Pittsburgh atheists, agnostics, secular freethinkers and all unbelievers. In fact, the Christian lineage among our founding fathers is very weak with John Adams explicitly stating “the Government of the United States of America is not in any sense founded on the Christian religion.” Also don’t bother wasting your time finding how many time the word “Jesus” appears in the founding documents. You won’t find it in any of the official founding documents. To matters even worse, State Rep. Brian Sims, the only openly atheist lawmaker in the PA House has not been allowed to give the invocation because of lack of faith. Rep. Borowicz should apologize to the House and particularly to the state’s first Muslim legislator, State Rep. Movita Johnson-Harrell, who was officially sworn in and had family members in the gallery during her Jesus rant. This was a very sad day for Pennsylvanians everywhere and needs to amended as soon as possible. WHEN ALLEGATIONS came to light last year of sexual abuse and inappropriate conduct involving children and seminarians by Archbishop Theodore McCarrick, Cardinal Donald Wuerl, who succeeded Mr. McCarrick as leader of the Washington archdiocese, expressed shock and denied prior knowledge. Now it turns out Mr. Wuerl was presented in 2004 with an account of Mr. McCarrick’s alleged misconduct, which he relayed to the Vatican. It is hard to believe that Cardinal Wuerl has not been removed from his position, asked to pay retribution to his victims, and charged with crimes in a court of law. Even the conservative talk show host, Hugh Hewett, recently described Wuerl as “The Con Man in the Cardinal’s Cap”. While the Steel City Skeptics would argue that all who wear the pointy cap are con men with regard to the truth, Wuerl is clearly at the top the game. I would also argue that prison time is not out the question as more details come forth. The Catholic church has failed to police its own, but there is not reason that civil authorities cannot proceed under civil laws. The sooner, the better. There has been a depressing fight going on in Ozark, Missouri, over a large lighted cross in a public park to celebrate Christmas. The rather ugly, lighted 20+ foot cross was constructed around a utility pole and is part of a drive-through holiday light display in Finley River Park. The problem with the lighted cross is quite clear from past rulings by the courts: The government must remain neutral with regard to religion, allowing secular symbols, such Santa Claus, reindeer, and snowmen, while disallowing religious symbols (see County of Allegheny v. American Civil Liberties Union, 492 U.S. 573, 1989). 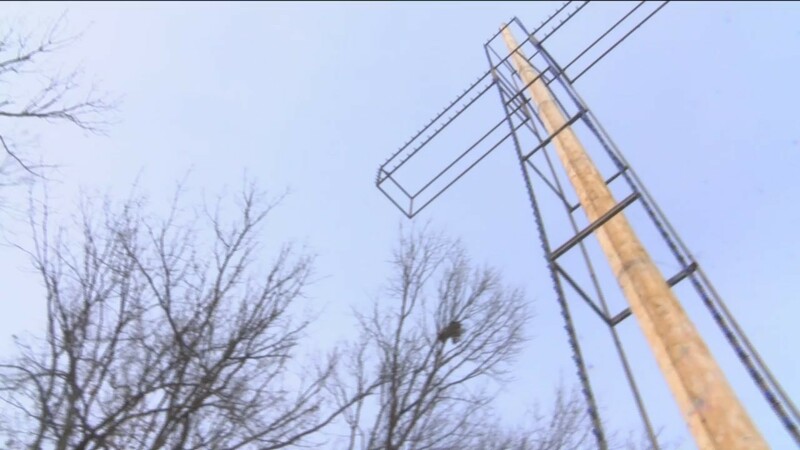 The city agreed to take down the cross after receiving a complaint from FFRF, but then immediately backed off that agreement, and will be leaving it up and lighted for this holiday season. The placement of the 20 feet tall Christian cross is not only a clear violation but also just the wrong symbol. According to the myth, baby Jesus was born in a manger on Christmas day. The whole execution-on-the-cross comes much later in the story, so in what way is the cross any part of the Christmas story? As for Ozark, Missouri, why not represent the secular icons of the season, of which there are plenty to go around? Let Christmas be the season of reindeer and Santa Claus. Let utility poles be poles. Even though Ozark sits in Christian County, Missouri (a true fact), it still needs to respect that there is a well-established separation of state and church to uphold. The Freedom From Religion Foundation’s 41st Annual Convention was a resounding success. Held November 2-4, 2018, in downtown San Francisco, just steps away from the California Street cable car, a BART station and ferry terminals, the location was ideal, even if the hotel itself was a little less friendly than we expected. For example, a simple request to the hotel staff, asking to remove the bibles from the rooms was ignored, resulting in a growing collection of rejected bibles in the hallway. Due to scheduling conflicts, the meeting rooms were on three different floors on three different days, some with clear gathering spaces near the meeting rooms but others with narrow hallways and little room to congregate with old and new friends. As a result, one did not see as many people gathering in the common spaces outside the meetings as has occurred during conventions in the past. Not surprising, many attendees were also drawn to the city outside, which was not unreasonable given the sightseeing opportunities in the San Francisco Bay area. Despite those logistical problems, the schedule of speakers was excellent. On Friday afternoon, Salman Rushdie gave one of the most notable keynotes that I have heard, engaging the audience with a mixture of thought, emotion, and humor. U.S. Congressman Jared Huffman, the founding member of the new Congressional Freethought Caucus, gave a rousing speech that demonstrated that belief in a god is not necessary to be an active member in Congress. (With representatives in California, Georgia, Maryland, Michigan, Tennessee, Washington, Wisconsin, and the District of Columbia, it would be great to have a Pennsylvania Representative added to the list). The first day ended with a presentation by actor John de Lancie and an engaging 90 minute monologue by former SNL member, Julia Sweeney. Saturday morning was a mix of reports by groups, such as the Secular Coalition of America and the FFRF legal team, followed by an afternoon of several international freethought battles being wage in countries outside of the US with the support of FFRF. The afternoon ended with Cecile Richards being interviewed on stage by Annie Laurie Gaylor in a free-flowing discussion on Texas politics, Planned Parenthood and women’s rights. After the conference dinner, the evening ended with the stand-up comedy of Leighann Lord, a Very Funny Lady as confirmed by her website is www.veryfunnylady.com. It turned out that the moniker was not misplaced and her wrap up the weekend activities was a great end to the formal conference activities. If you missed it this year, you should start making your plans for the at least one of the next three conventions. I think the real question is why did he pick the 57th time? It does not seem like a random number. Perhaps he channeling Heinz Ketchup, or perhaps there is some other nefarious reason behind this secret code. Perhaps it is that the premise of his claim makes no more sense than the conclusion. I will go with the last assumption, which makes me wonder why anyone would listen to his nonsensical claims on any topic. Religious Freedom (“I’m free to practice my religion, and you’re free to practice mine”). A powerful anti-gun song: To the Victims We Send Our Thoughts and Prayers. Roy has played for numerous secular-minded audiences across the country – most recently at the American Humanist Association (AHA) national convention in Las Vegas and the Freedom From Religion Foundation (FFRF) national convention, as well as the recent PAStAHCon in Philadelphia. To get a glimpse, check out the video link to Religious Freedom (To Burn Our Own Witches). The concert will be Sunday, September 16 @ 7 pm at First Unitarian Church, 605 Morewood Ave on the corner of Melwood and Ellsworth Avenue in Shadyside. The cost is “$20 or pay what you can”. At any price, it will be show not to miss.